A good winner at Moonee Valley on Saturday and we have Outback Warrior and Metson to run for us at Cranbourne on Sunday. Strike Force led all the way to win on Saturday and at Cranbourne Metson runs in race six, the Class 1 Handicap over 1400m with Patrick Moloney to ride and jumping from barrier six. “We’re happy with the way he has trained on and I think the soft ground will certainly be in his favour,” Moroney said. “The drop back in distance as well should suit him so he looks well placed in a race that does not look that deep. Outback Warrior (pictured) runs in race eight, the Benchmark 70 Handicap over 1000, jumping from barrier two with James Winks to ride. Outback Warrior scored over 1013m last start at Sale and Moroney is pleased with the way the son of Toorak Toff has progressed since. “He’s drawn nicely but he was a tad slow away last start,” Moroney said. “If he doesn’t get way with them Cranbourne is a track you can sweep around them so I think we’ve got it covered either way. 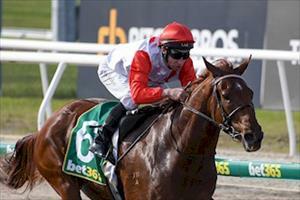 “He’s trained on well from the last start, his last gallop was terrific and he looks particularly well.